Picture using one of our wine and cheese invitations to create a dreamy, blush-and-bordeaux Dinner Party. It sounds like such a fun excuse for an adult night! 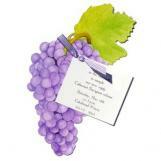 You can start with one of our gorgeous wine invitations. Then add a romantic outdoor setting, also known as your backyard. Imagine it filled it with rustic-glam decor, cozy pillows. Loads of appetizers and desserts, and wine-a-plenty. So, in other words, a table full of adult fun. Adult wine and cheese parties tend to be a little less formal, so feel free to get creative with your location. When planning, start with one of our cheese party invitations. Give your party a cozy vibe. The outdoor space will let you setup a tablescape like no other. You can set it in front of a stone fireplace or fire pit to provide the perfect amount of warmth on a cool fall evening. To set the tone, our secret? Don't feel pressured to stick with traditional colors or decor. Use an unexpected color pallet of wine and blush tones, which contrast beautifully with the natural stone and wood elements of the outdoors. Set the dining table with vintage china and glass goblets paired with fun patterned napkins. You can create custom menus and add gold flatware from your local home goods store. Don't forget the details. Incorporate fresh florals. You can use greenery from your yard and add flowers. You will be surprised how this touch can quite literally transform a space and elevate a party to a whole new level. For your menu, serve a signature drink, then add some classic wines. Get creative and whip up a fun seasonal drink, but also make sure you have all of your bases covered. For the fall you can do a Honeycrisp apple sangria. Then choose three to four wines to serve at the party, including a chardonnay, a pinot noir and a sparkling rosé. For your meal, try a fall-inspired appetizer and ask each guest to bring a potluck dish to share. The appetizers included cranberry brie bites, butternut squash and prosciutto wrapped apples with blue cheese. Last but not least, the desserts! If it were up to us, we would probably skip dinner and go straight for desserts! Serve up a choice of sweet treats, such as pumpkin spice cake, gourmet donuts (which are super on trend right now), turtle cheesecake and fresh pies. As a parting gift for each guest, you can create a small DIY greenery wreath that doubles as decor on the backs of the chairs during the party. Whether you are hosting an event or attending one, party favors and hostess gifts are a great way to leave a lasting impression. The concept of the wine and cheese party is so elegant. The cheese table and elegant wine selections can fit in with so many events from weddings to birthdays and the best thing about a cheese and wine party, once it's set up the host can just sit back and relax while guests graze for hours. It makes us hungry just thinking about it. Cheers!